Welcome to Fish Window Cleaning of Cincinnati, OH, including Eastgate, Indian Hill, West Chester, Liberty Township, Hamilton, Wyoming, Anderson, Amelia, Batavia, Loveland, Mason, Middletown, Milford, Norwood, Delhi, Cheviot, and the Tri-State Area! We clean COMMERCIAL and RESIDENTIAL accounts. Call (513) 693-4840 for a free on-site estimate today! Keeping your windows, screens, sills, storm doors, and gutters clean go a long way to helping your house look its best! We provide all of these services and more! We can make your chandeliers sparkle, remove all of the fingerprints and smudges from your mirrors, and even clean your ceiling fans! Our team is trustworthy, respectful, and always strives to keep the peace and quiet in your home. We wear fresh shoe covers while in your home and we use cloth pads under your windows as we clean to protect your floors. We lead the industry with our safety program and our cleaning products are environmentally-friendly so you and your family are not subjected to harsh fumes. 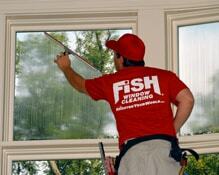 You can rest assured that when you hire Fish Window Cleaning your home will be in good hands! Do you ever wonder if your customers notice those fingerprints all over the windows in your showroom? Or the cobwebs in the corners of your large storefront windows? What about those streaks and smudges on the windows in your restaurant? Your windows are usually the first thing your customers will see so chances are that they do notice these problems. Give your customers a great first impression with windows that sparkle all year long! We'll not only remove all smudges, streaks, and fingerprints, we'll also wipe down your sills and remove any cobwebs. We can also remove tape and promotional window paint. We even provide the peace of mind that our professional cleaning team is licensed, bonded, and insured. Do you live in Northern Kentucky? Click here to view our KY page!